Last month, the Cheval Roc Nursing and Residential Home opened atop a 100-foot-high coastal cliff. After heavy rains rocked the area last week, a significant portion of the cliff collapsed, prompting the inevitable question: Why the hell did the developers choose to build an old folks home in such a precarious spot? This spanking new nursing home was recently built in Jersey, a large island situated in the English Channel about 85 miles (137 km) south of the English coast. The facility opened to residents just last week. Shortly after people started moving in, the area was battered by storms and 75 mph (120 km/h) winds, which likely triggered this rather serious cliff collapse. 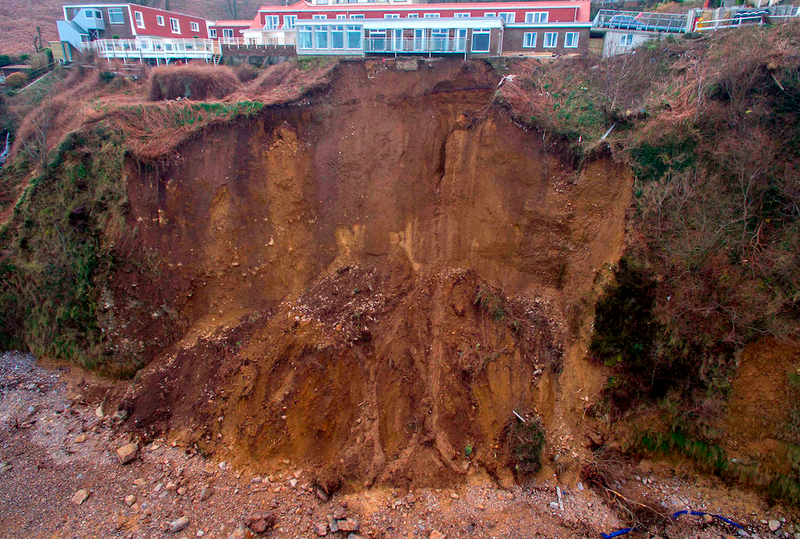 The tip of the landslide is located just a few feet from the new care home. A view of Cheval Roc before the collapse. As reported in the Jersey Evening Post, no one was injured when it happened, but three rooms closest to where the land fell away (all of which were vacant) are now off limits. Ten residents currently live in the home, and they’re being allowed to stay while engineers figure out if the cliff face is stable. The engineers say there’s no threat to the building’s structure (which seems hard to believe looking at the photos), and that “further work may need to be carried out to reinforce the cliff face.” Which seems to be a foregone conclusion given just how bad this looks. Over at the AGU Landslide Blog, geologist Dave Petley wonders why development was permitted on this site. Incredibly, it appears that the developers were warned by a former planning chief officer about potential structural failures. Yet construction proceeded anyway. A number of severe storms have struck the region recently, and it’s possible that these storms are being driven by El Niño. Perhaps the developers weren’t expecting weather on this scale, but given El Niño’s track record, and the geological evidence available, construction of this nursing home on this particular location appears to have been a really stupid decision.